"The world is a beautiful place worth fighting for, and I hate to leave it." When Ernest Hemingway's Robert Jordan is wounded at the end of "Whom The Hour Strikes", waiting for his last fight, these are his last thoughts. My father had every reason to believe that the world was a terrible place. My dad had every reason to think that the world was not worth fighting for. My dad had every reason to think that the world was worth going. He did not think about all these things. Like the hero of his favorite book, John McCain took the opposite view. You had to have good luck to have such a good life. I am here before you today, saying the words I never wanted to say, giving the speech I never wanted to give, feeling the loss I never wanted to feel. My dad is gone. John Sidney McCain III was many things. He was a sailor, he was an aviator, he was a husband, he was a warrior, he was a prisoner, he was a hero, he was a congressman, he was a senator, he was appointed president of the United States. These are all titles and roles of a life that was well lived. They are not the greatest of his titles or the most important of his roles. He was a great man. 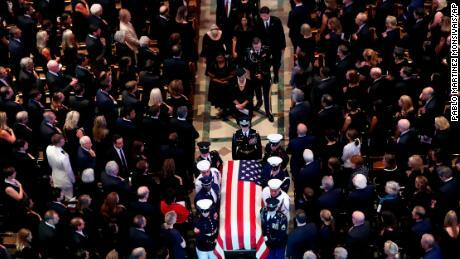 We gather here to mourn the passing away of American magnificence, the real thing, not the cheap rhetoric of people who will never so readily approach the victim, nor the opportunistic appropriation of those who comfort and privilege themselves throughout their lives suffered and served life. He was a big fire that burned brightly. Imagine, the warrior, the knight of the sky, gently carries his little girl to bed. Imagine the dashing aviator taking his plane, plunging from the decks of the South China Sea and kissing the pain as I fell and skinned my knee. Imagine the excellent statesman who advised the President and the Mighty to sing with his girl in Oak Creek during a rainstorm, "Singin 'in the Rain." Imagine, the Senator, a strong conscience of the nation's best self, takes his 14-year-old daughter out of school because he believes that I would learn more about America in the town halls he held throughout the country. Imagine the old veterans of war and government, whose wisdom and courage were sought after by the most distinguished men of our time, with their shining eyes of happiness as he blessed the wedding of his grown daughter. You must all imagine that. I do not have to, because I lived everything. I know who he was. I know what has defined him. I have seen it every day of my blessed life. John McCain was not defined by the prison, the Navy, the Senate, the Republican Party or any of the acts in his absolutely extraordinary life. John McCain was defined by love. Some of you out there in the pews, who crossed swords with him or were at the end of his famous minds, or were interested in a cross against him on almost anything, or right now you're doing your best to stone to stay. not confronted. You know perfectly well that if John McCain were in your shoes today, he'd use some salty words he'd learned in the Navy while my mother nudged him in the arm. He would look at her and grumble and maybe stop talking, but he would keep grinning. She was the only one who could do that. On her first date when he still did not know what kind of woman she was, he recited to her a Robert Service poem entitled "The Cremation of Sam McGee" about an Alaskan Prospector who considers his cremation the only one Walk warm in the icy north. "There are weird things done in the Midnight Son, of the men looking for gold, the Arctic lanes have their secret stories that would make your blood cold." He had learned it in Hanoi. A prisoner in the next cell had repeatedly resorted to code during the long years of captivity. My dad thought that if Cindy Lou Hensley got through this and appreciated the dark humor that had seen him through so many years of cruel imprisonment, maybe she would spend a lifetime with him, and so she did. John McCain was defined by love. My father's love for my mother was the most violent and most enduring of all, Mama. Let me tell you what love means to John McCain and me. His love was the love of the Father who comforts as well as he. He was endlessly present to us, and although we did not always understand it, he always taught. He did not expect us to be like him. His ambitions for us, freed from all worldly accomplishments, should be better than he, armed with his wisdom and informed by his experience long before we were old enough to build our own. As a girl, I did not appreciate what I value most now, how he suffered, and how he carried it with stoic silence that was once the mark of an American. I recognized it first when he asked me to. I was a little girl, thrown by a horse and crying from a broken collarbone. My father picked me up. He took me to the doctor and he got me ready. Then he immediately took me home and made me sit back on the same horse. I was mad at him as a kid, but how I love him now. My father knew pain and suffering with an intimacy and immediacy that most of us are blessed to never endure. He was shot down, crippled, beaten, starved, tortured and humiliated. This pain has never left him. The cruelty of his communist kidnappers ensured that he would never raise his arms over his head for the rest of his life. But he survived, but he endured, but he triumphed. And there was this man who had been through everything with a little girl who just did not want to go back to her horse. He could have seated me and told me all about it and made me small because my complaint and my fear had nothing to do with his pain and memory. Instead, he made me feel loved. "Meghan," he said in his calm voice, which spoke with authority and said that it was best to obey, "go back to the horse". I did. And because I was a little girl, I refused. Now that I'm a woman, I look back and see the expression on his face as I climbed back up and rode again, and I saw the pride and love in his eyes as he said, "Nothing will break you." For the rest of my life, when I fall down, I get up again. If I'm hurt, I drive on. When I'm low, I rise. 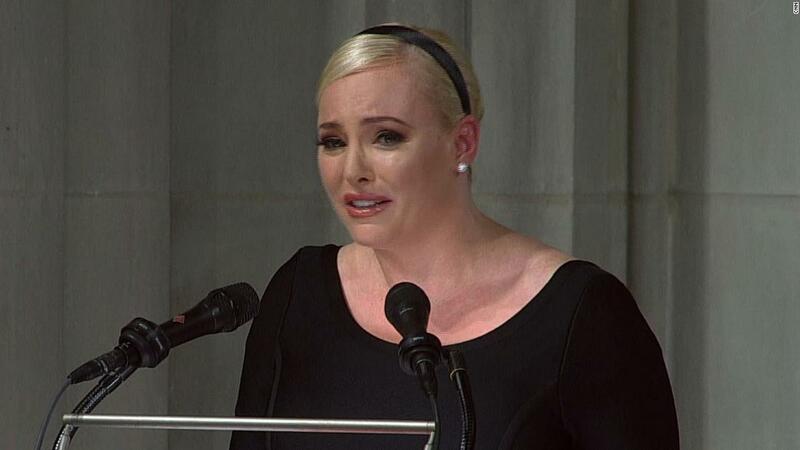 That's not because I'm uniquely virtuous or strong or resistant, but simply because my father, John McCain, was. When my father became ill, when I asked him what he should do with this eulogy, he said, "Show them how hard you are." That's love that John McCain meant. The love of my father also meant looking after the nation that was entrusted to him. My father, the true son of his father and grandfather, was born in a lasting sense of the harsh character of American greatness and was convinced of the need to defend him with fierceness and faith. John McCain was born in a remote and now defeated outpost of American power, and he understood America as a sacred trust. He understood that our republic demands responsibility even before it defends its rights. He knew that navigating between good and evil was often difficult but always easy. He understood that our purpose and meaning were rooted in the responsibility of a missionary dating back centuries. Just as the first Americans saw a new world of opportunities for a great experiment in freedom and self-government, so do their offspring have the responsibility of protecting the ancient world from its worst self. The America of John McCain is the America of the revolution. Fighters without stomach for the summer soldiers and sunshine patriots who use the freedom bells to recreate the world. The America of John McCain is the America of Abraham Lincoln. Fulfilling the promise of the Declaration of Independence, that all men are created equal and suffer greatly to persevere. The America of John McCain is the America of the boys who hurried the colors in every war over three centuries, for in them is the life of the Republic, and especially those through their audacity, as Ronald Reagan said, gave their chance to husbands and Fathers and grandfathers gave up their chance on venerable old men. The America of John McCain is, yes, the America of Vietnam, fighting the struggle even in the most remote of reasons, even in the worst circumstances, even in the farthest and most hostile corner of the world, even in defeat for life and the Freedom of other peoples in other countries. The America of John McCain is generous and inviting and daring. She is resourceful and confident and secure. She comes to her responsibility. She speaks softly because she is strong. America does not brag because she does not need it. The America of John McCain does not have to be made big again because America has always been great. That ardent faith, that proven devotion, that enduring love that drove my father from the fiery sky over the delta of the Red River to the edge of the Presidency itself. Love has defined my father. As a young man, he wondered if he would live up to his excellent line. I miss him so much. I want to tell him that he did it. But I carry some comfort in it. Somewhere in the great beyond, where the warriors go, two US admirals meet their beloved son. They tell him that he is the greatest of them. Dad, I love you, I always have. Everything I am, everything I hope, everything I dream is based on what you have taught me. You loved me and you showed me what love must be. An ancient Greek historian wrote that the image of great men is woven into the lives of other men. Dad, your size is woven into my life, woven into my mother's life, woven into my sister's life and woven into my brothers' lives. It has been woven into the life and freedom of the country to which you have sacrificed so much to defend it. Dad, I know you were not perfect. We live in a time when we upset old American heroes for all their imperfections, when no leader wants to admit guilt or failure. They were an exception, and they gave us an ideal to strive for. Look, I know, you can see this rally here in this cathedral. The nation is here to remember you. Like so many other heroes, you let us hang on the flag you loved. You defended it, you sacrificed it, you always honored it. It is good to remember that we are Americans. We do not put our heroes on the pedestal, just to remember them, we elevate them because we want to emulate their virtues. That's how we honor them, and that's how we honor you. My dad is gone. My dad is gone, and my grief is immense, but I know his life, and I know it was great because it was good. And as much as I hate seeing him go, I know how it ended. I know that on the afternoon of August 25 off Oak Creek in Cornville, Arizona, surrounded by the family he loved so much, an old man shook off the scars of the battle one last time and a new man showed up for a last to control the flight. Up and up and up, destructive clouds left and right, straight ahead to the Kingdom of Heaven. And he slipped into the earthly bonds, stretched out his hand and touched the face of God. I love you, dad.